This journal aimed at communicating the results of research of professors, teachers, practitioners, and scientists in the field of in banking and finance covers wide range of islamic studies forms such as Fiqh Muamalah, Economy, Banking, Finance, Islamic Studies and Business Model issue. Readers targeted by this journal are professors, students, teachers, and everyone who dwells on banking and finance covers wide range of islamic studies forms such as Fiqh Muamalah, Economy, Banking, Finance, Islamic Studies and Business Model issue. 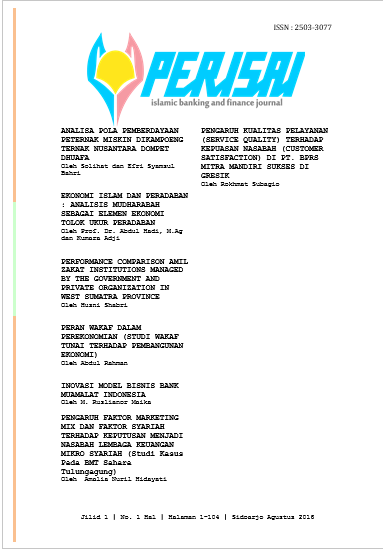 Articles to be published on Perisai : Islamic Banking and Finance Journal should follow the focus and scope of this journal. The articles must have been edited according to the journal author guidelines before submitting.